1 oz silver Proof Legalized Washington! .999 pure silver, BU, COA, Micro Mintage of only 1000! Rare extremely limited limited! Protective plastic capsule safe for long term storage! 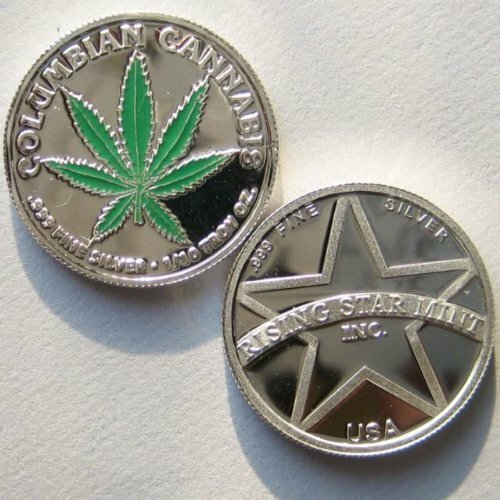 These rounds symbolize and support the legalization of marijuana in Washington which was one of the first states to legalize the plant for recreational use. These proof rounds have a very low mintage, which further adds to their collectibility. Obverse: Depicts the marijuana plant breaking free from its shackles which symbolizes ending the war on medicine. Reverse: Displays a rendition of the Washington seal with the date that Washington legalized marijuana, which was in 2012. These Silver rounds possess impeccable detail and craftsmanship. Add this beautiful 1 oz Silver Proof Round to your collection today! Each round features a beautiful finish that gives it a unique look and feel that further adds to its collectibility. The obverse and reverse are struck to exhibit a 3-D effect, adding dimension and a life-like appearance, as the detail seems to pop off the round's surface. Washington Initiative 502 was an initiative to the Washington State Legislature, which appeared on the November 2012 general ballot, passing by a margin of approximately 56 to 44 percent.